I would like a 7' x 7' mattress, which is a size that only seems to exist in England, but not the US. I can get sheets shipped to me from England but not a mattress. So therefore I am looking to mostly construct my own mattress. I am interested in a supportive form fitting mattress, so I am going to go with mostly dunlop latex, one with vertical holes throughout for air. However many latex mattress companies can't make anything larger than a California King for whatever reason. Last edit: 11 Jul 2017 09:13 by MiscellaneousBeef. Some of the better sources of which I am aware for latex componentry are listed in the component thread here . Many of these suppliers can create custom sizes for you. 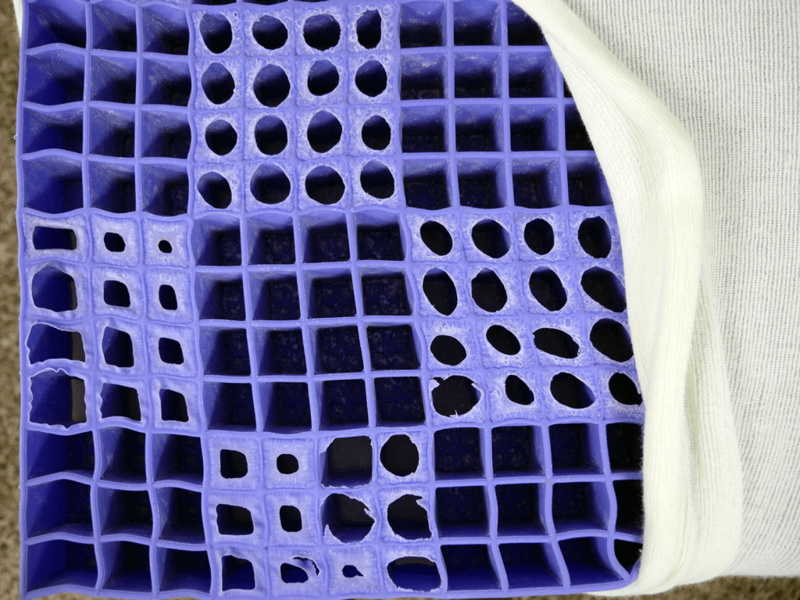 Most of the latex you’re likely to encounter will have pinhole construction, not only to change the comfort of the foam, but also as a by product of making the curing process consistent. The extra breathability this affords is a nice extra bonus. In North America the longest “standard size” mattress is the California King at 84”, but the widest “standard size” mattress is the traditional king at 76”. But layers can be seamed to create virtually any size you desire. Latex cores tend to top off at 6” in thickness, so you’d need at least two layers to achieve your 8”-9” overall thickness. As for the buckling column gel, here are three manufacturers that have different versions of buckling column gel. One is Intelligel and one is NexGel (now owned by Spring Air / Sommex since Natura went bankrupt) and Leggett & Platt now has a version called Somnigel which is being used by King Koil and several other manufacturers in their mattresses. A forum search on " orthogel " which is used in the Nexgel mattress or on " intelligel " used in the Intellibed, or on " somnigel " which is a newer version that is used by several manufacturers (you can just click the links) will bring up more forum comments about them. I’m not aware of sources to the public for custom sized buckling column gel layers, so this may require you to do some phoning directly to Intellibed or Leggett and Platt with your request to see if they are able to offer you any advice/assistance. Not sure about where you could source latex cut in custom sizes, Phoenix may have some suggestions for that. As for the hollow gel column material Leggett & Platt manufactures that under their SomniGel brand, and while I believe they may only sell to manufacturers you could probably contact them to inquire about where you might be able to purchase what you're looking for. Good luck! Thank you for the welcome and informative replies! I have reached out to some of these companies and am eagerly awaiting their responses. You're welcome! I'll look forward to learning of your progress. It seems a lot of places are mainly offering the option of cutting and gluing latex pieces together rather than one continuous 7' x 7' latex mattress/core. Would the feel of the glued portions be noticeable in use or does latex glue together mostly seemlessly? It seems a lot of places are mainly offering the option of cutting and gluing latex pieces together rather than one continuous 7' x 7' latex mattress/core. Would the feel of the glued portions be noticeable in use or does latex glue together mostly seemlessly? Dunlop is made in two versions. One is a mold and this would be similar to Talalay with mold sizes that vary by manufacturer. Some Dunlop molds are king size and others go up to queen size but I don't know the mold sizes of each manufacturer, but I believe generally the largest is 78” wide by 80” long. I don’t think you’d notice a glue seam in a fabricated Dunlop layer. They use non toxic latex based glue which is very strong and flexible and they match the pieces very carefully so the glue seam is usually undetectable. The second method of making Dunlop is a continuous pour method similar to how they produce polyfoam where the foam is made on a moving belt. This can be made in king size without a glue seam. Latexco produces their Purelux with this method but it is only produced in thinner layers of 3". 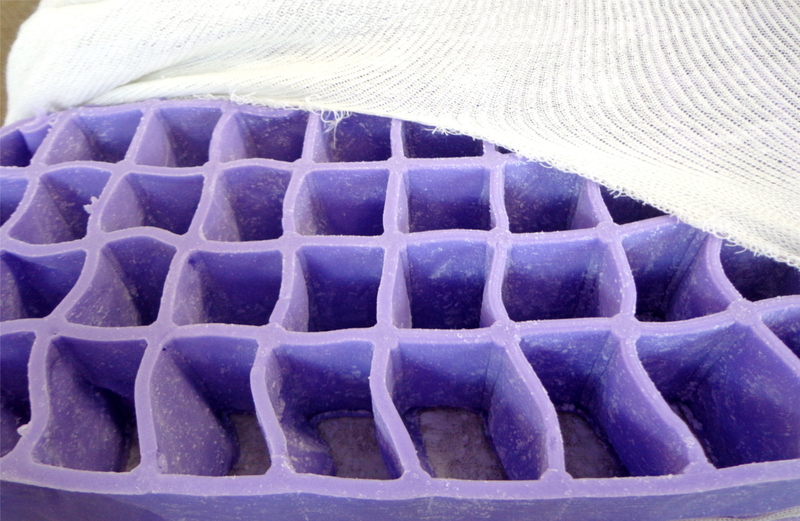 It is produced without pincores which are sometimes punched in the foam afterwards (they give their customers an option of having pincores or no pincores). The thinner layers don't require pincores to cure. Mountaintop also pours continuous pour layers up to 7" and these use pincores and are also made in King size with no glue seams. Both of these are poured in the US. So I finally ordered the main components to my mattress: a 7'x7' latex core (which will be multiple chunks of latex glued together professionally with latex glue) and a couple mattress toppers (whose innards are buckling column gel that I will be cutting out and attaching to the core). I will order the cape to put it all together once I have the final measurements since I don't know for sure what the thickness of the gel will be. Since I will need to glue buckling column gel to itself, and then to the latex mattress core, I still need to buy glue to do this. What glue(s?) would you recommend I use for both of these steps? Last edit: 23 Aug 2017 14:15 by MiscellaneousBeef. Thank for the update! I’m glad you were able to source what you need. I’m not familiar with what would be the best type of adhesive to use in this situation. Common "latex water-based" adhesives incorporate various types of elastomers (including but not limited to natural or synthetic latex) in different quantities as opposed to adhesives that use solvents (rather than water) and which often have higher levels of VOCs, and these are commonly used in the industry. There is some good information about different types of adhesives here and some information about some different types of latex adhesives here that may be helpful to you. Perhaps there are other site members who have some experience using these adhesives who are more knowledgeable and can share their experiences. I'm no expert on adhesives but I would imagine that gluing latex to latex might require a different type of adhesive than gluing latex to buckling column gel, so I'd suggest contacting your supplier of the gel toppers to get their input on appropriate adhesives for gluing the gel to latex.